Ekallatum was a small Amorite city state of the Numha tribe which was located somewhere on the west bank of the upper Tigris, to the south of Assyria's capital at Ashur. Its name means 'the palace'. The city was only important for the space of a century or so, and its exact location is unknown. It was first ruled by a relative of the early Assyrian royal house, Ila-Kabkaba. When Assyria was conquered by Naram-Sin, king of Eshnunna, Ila-Kabkaba's son (or descendant), Shamshi-Adad, fled to Babylon. Following Naram-Sin's death, he returned to take power when he recaptured Ekallatum, re-founding his own kingdom, and spending three years building up his forces there. Then he overthrew the Assyrian king, Erishum II and dominated all of northern Mesopotamia. Possibly an Amorite member of the Assyrian royal house. Mari and Ekallatum begin a feud that lasts on and off until c.1761 BC. Ekallatum is captured and occupied by Naram-Sin of Eshnunna. Shamshi-Adad is forced to flee to Babylon, until he can recapture his home city seven years later. Recaptured the throne and founded an empire. Died in battle. Shamshi-Adad sets up the kingdom of Upper Mesopotamia. He hands over Ekallatum to one of his sons to rule in his name. Shamshi-Adad is killed in battle. Although Ishme-Dagan is a capable military leader, his reign is chaotic and he is never able to assert control over his father's empire. Apum, the capital of the kingdom of Upper Mesopotamia, is lost very quickly while the king continues to rule Ekallatum. Yasmah-Adad is overthrown and Mari is also lost. The city becomes allied to the Babylonians under Hammurabi while Ishme-Dagan collects allies in the north and the two states renew their mutual hostilities. 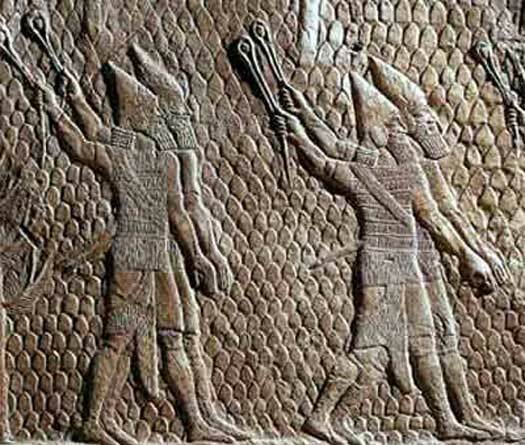 The Elamites capture Ekallatum, forcing Ishme-Dagan to seek refuge in Babylon. Hammurabi crushes the Elamites, returning Ishme-Dagan to his throne, albeit as a vassal king, from where he also seems to retain control over Assyria during his lifetime. The Yamutbal cede the city of Sadduwatum, the first station on the trading route from Ashur to Kanesh, to Ekallatum. Drove-Asqur is the last-known king of Ekallatum, and the city mostly disappears from the historical record after his reign.